Compatible with 24 Volt Chinese-made electric scooters, bicycles, dirt bikes, pocket bikes, go-karts, ATV's, quads and mini choppers. 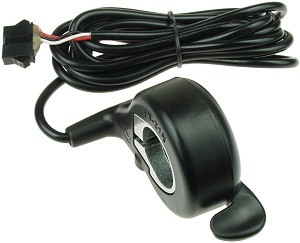 These type of throttles are sometimes referred to in owners manuals as a throttle, throttle cable, accelerator, go bar, twist bar, speed bar, turn throttle, speed control, or derailleur. All throttles on this page fit standard 7/8" (22mm) handlebars. 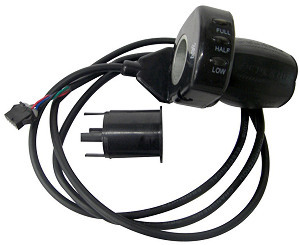 Twist throttle with 36V battery power indicator. 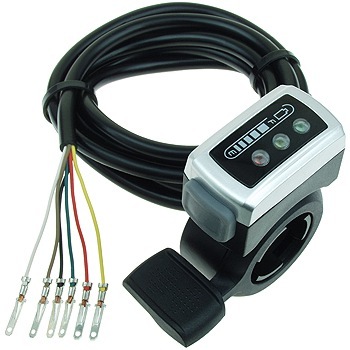 The indicator has three LED lights which are MIN (red) for minimum, MID (yellow) for middle, and MAX (green) for maximum battery pack power level status. 64" long throttle cable. Red, black, green, and blue wires with 2.8mm wide male connector pins for white wire connectors. Handlebar grip with inside flange. For use on the left side of handlebars with all throttle types. 4-1/4" grip length. 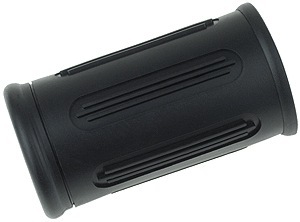 This is the matching left hand grip for twist throttle item # THR-48 sold above. 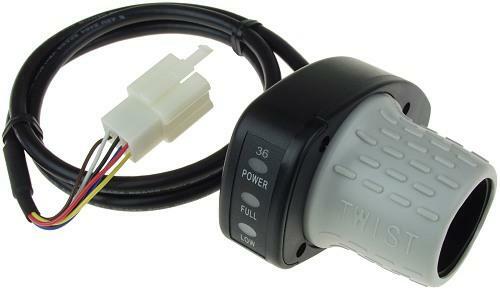 Twist throttle with 36 Volt power meter. Five LED battery indicator lights: red for power-on, yellow and green for 36 Volt battery pack status. Red, blue, green, and yellow wires with 2.8mm wide male connector pins for white wire connectors. 46" long throttle cable. Includes matching left hand side grip. 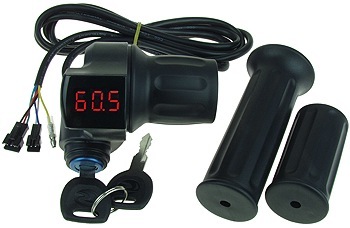 Twist throttle with 36 Volt power meter and key switch with two keys. Five LED battery indicator lights: red for power-on, yellow and green for 36 Volt battery pack status. Red, black, green, yellow, and white wires with 2.8mm wide male connector pins for white wire connectors. 46" long throttle cable. Includes matching left hand side handlebar grip. 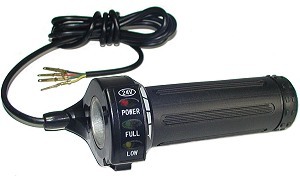 Twist throttle with 36 Volt power meter. Three LED indicator lights: red for power-on, green, and yellow for 36 Volt battery pack status. 64" long throttle cable. Red, blue, green, and yellow wires with 2.8mm wide male connector pins for white wire connectors. 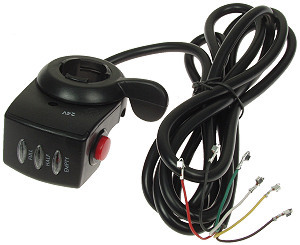 Half twist throttle with key switch and 0-99.9 Volt red LED digital battery level indicator. Key is removable in off position only. Includes matching grip set for left and right sides of the handlebar. 60" long throttle cable. Red, black, green, blue, white, and yellow wires. Two black wire connectors and one 4mm bullet connector. Twist throttle with 36V power meter. Red maintained on/off push button switch with normally open contacts. Three 36 Volt battery pack status LED indicator lights: red for empty, yellow for half and green for full. Fits 7/8" (22mm) handlebars. 64" long throttle cable. Red, black, white, green, yellow, and brown wires with 2.8mm wide male terminals for white wire connectors. 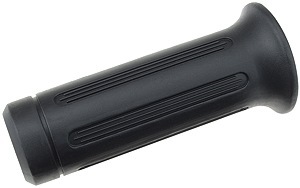 Handlebar grip without inside flange for half length twist throttles. 2-3/8" grip length. Handlebar grip with inside flange. For use on the left side of handlebars with all throttle types. 4-1/4" grip length. 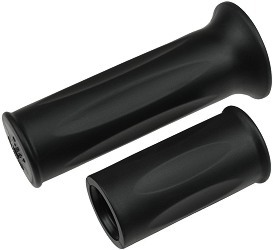 Set of two handlebar grips for use with the half length twist throttle sold above. 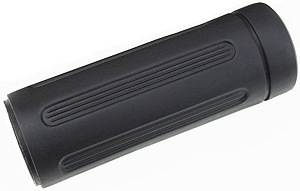 The long grip is 4-1/4" and the short grip is 2-1/2". 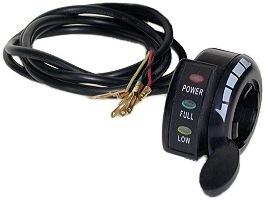 Thumb throttle with 36 Volt battery level indicator. Gray latching on/off push button switch. Cable exits back of throttle so throttle can be used on either right side or left side of the handlebars. 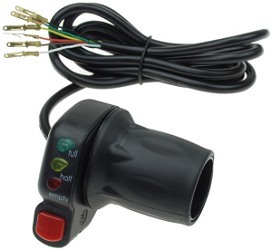 Three LED battery indicator lights; red for empty, yellow for half, and green for full. 64" long throttle cable. Red, black, green, yellow, brown, and white wires with 2.8mm wide male connector pins for white wire connectors. 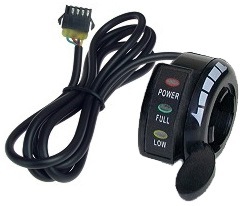 Thumb throttle with 36V power meter and latching red push button on/off switch. Three LED 36 Volt battery pack indicator lights: red for empty, yellow for half and green for full. 64" long throttle cable. Red, green, black, white, yellow, and brown wires with 2.8mm wide male connector pins for white wire connectors. 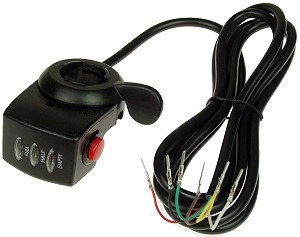 Thumb throttle with 36V power meter and latching red push button on/off switch. Three LED 36 Volt battery pack indicator lights: red for empty, yellow for half and green for full. 64" long throttle cable. Red, green, black, white, yellow, and brown wires with male connector pins for black wire connectors. Thumb throttle with 36V power meter. Three LED 36 Volt battery pack indicator lights: red for empty, yellow for half and green for full. 64" long throttle cable. Red, green, black, white, yellow, and brown wires with female connector pins for black wire connectors. Handlebar grip without inside flange. For use on the right side of handlebars with thumb throttles. 3-3/4" grip length. 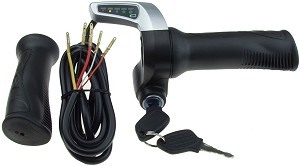 Replacement twist throttle with power meter and matching grips for certain models of 36 Volt Razor® electric scooters, bikes and go karts. Four terminal connector with four terminals installed in it. To determine the correct throttle for your Razor® vehicle select your model. Twist throttle with matching for certain models of 36 Volt Razor® electric scooters, bikes, and go karts. Six terminal connector with five terminals installed in it. Replaces 5-wire throttles on certain models. To determine the correct throttle for your Razor® vehicle select your model. 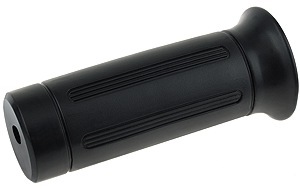 Replacement twist throttle for certain models of 36 Volt Razor® electric scooters, bikes, and go karts. Six terminal connector with five terminals installed in it. 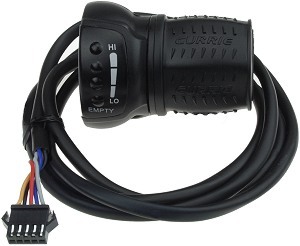 Replaces 5-wire throttles on certain models. To determine the correct throttle for your Razor® vehicle select your model. 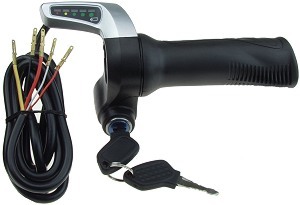 Twist throttle with 36 Volt power meter and 5 terminal connector for eZip®, IZIP®, and Schwinn® 1000 series electric scooters. Wire colors: orange, black, red, blue, gray. 62" long throttle cable with connector. To determine the correct throttle for your electric scooter select your model. 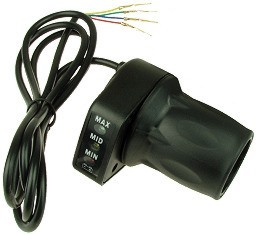 Replaces older version throttles with blue, black, red, green, and brown wires or blue, black, red, green, and gray wires. 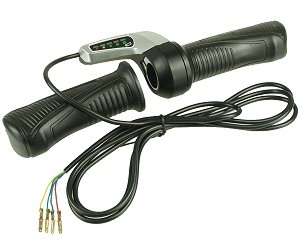 Thumb throttle with 36 Volt battery meter and 5 terminal connector for eZip®, IZIP®, and Schwinn® 1000 series electric scooters. To determine the correct throttle for your electric scooter select your model. 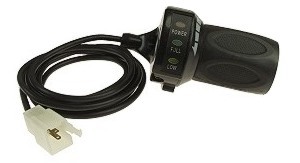 Foot throttle for 36 Volt eZip® , IZIP®, Schwinn®, Mongoose®, and GT® electric scooters with 5 wire throttle connector. No power meter lights. For use only with scooters that have seats. Requires drilling four 1/4" mounting holes and one 11/16" cable hole into the footplate for installation (remove footplate before drilling). Converts hand throttle operated scooters into foot throttle operated scooters. 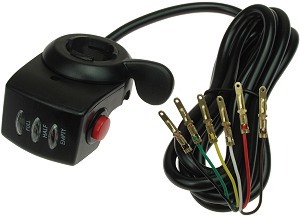 For eZip® , IZIP®, Currie®, Schwinn®, Mongoose®, and GT® electric scooters with 6 wire throttle connector. 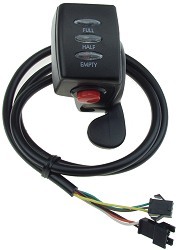 Three LED battery indicator lights, Full, 2/3 and 1/3 power for 36 Volt battery pack status. Wire colors: Red, Black, Blue, Green, Yellow, and Grey. 60" long throttle cable with 6 terminal connector. Works with all eZip® and IZIP® electric scooters that have 6 wire throttles. 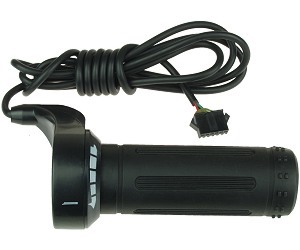 THR-600 replacement full length twist throttle for eZip® , IZIP®, Currie®, Schwinn®, Mongoose®, and GT® electric scooters with 6 wire throttle connector. This throttle has no battery indicator lights. 60" long throttle cable with 6 terminal connector. Works with scooters that have 6 wire throttles. 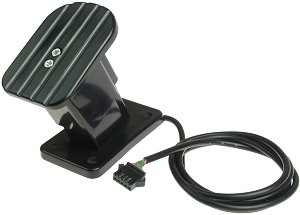 THR-600 replacement thumb throttle for eZip® , IZIP®, Currie®, Schwinn®, Mongoose®, and GT® electric scooters with 6 wire throttle connector. This throttle has no battery indicator lights. 60" long throttle cable with 6 terminal connector. Works with scooters that have 6 wire throttles. Throttle for the Zümaround Züm electric scooter. Easy plug-and-play installation. Throttle for IZIP® Tricruiser three wheel electric tricycle. 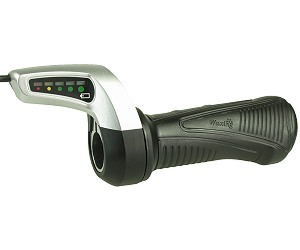 To determine the correct IZIP® electric scooter or bike throttle select your model.